Flattering50: Spring Coats Over 50: Now That's a Print! Editor's Note: Before I start this post, I just want to congratulate Deborah S. Deborah's name was randomly selected as the winner of the recent Flattering50 Sweater Giveaway. She has won a cardigan by designer Ronen Chen. Meanwhile, there is still time to enter the Flattering50 Topaz Necklace Giveaway. For details, click HERE. In my last post, I modeled my bright-colored spring coats and shared some online shopping sources. 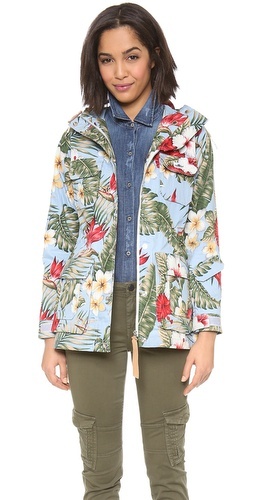 This spring, I'm also mad about rain coats with prints. Talk about energizing! A printed spring coat is a great way to shake off old man winter once and for all. Also, prints hide all those little lumps and bumps, making them a flattering choice for women over 50. If a printed spring coat appeals to you, I don't think you'll have any trouble finding one--they're everywhere! There are raincoats with geometric prints like the Banana Republic Gingham Trench - Preppy navy (above) as well as fun, floral print and animal print coats. This post features one or two of each. I will be absolutely shocked if my next spring coat doesn't have a print. Here's a very upbeat floral coat from Land's End. It's available in Regular as well as Petite, Tall and Plus.